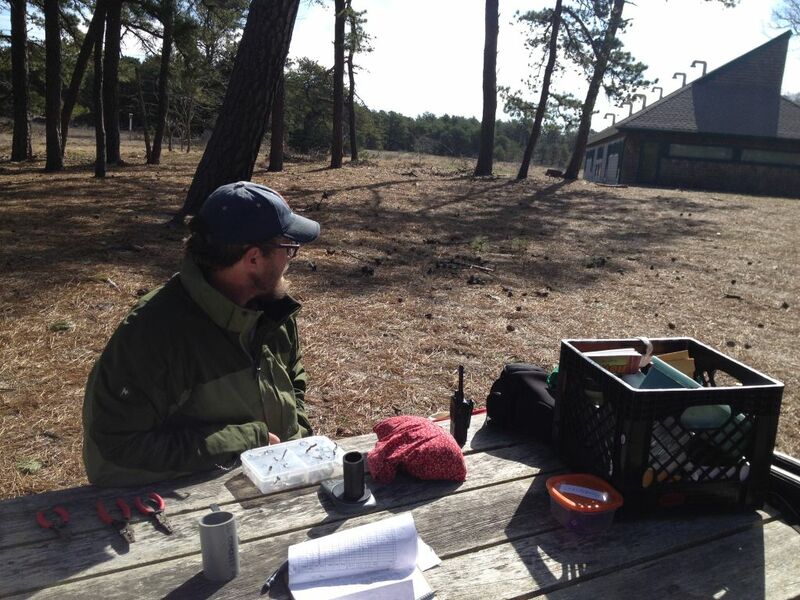 Having banded birds for 10 years in locations around the world, wildlife biologist James Junda has concluded that there’s only one reliable factor for forecasting whether a day will bring in a lot of spring migrants on Cape Cod: a southwest wind. Better yet– several days of southwest winds. “It’s not about temperature and it is not about sunshine. It is about wind direction and if we have a sunny day with northeast winds, we will not get any migrants flying into the wind to arrive on Cape Cod,” he says. One of the hallmarks of a day with a southwest wind is what’s called “return day”, when some of the species that breed at the sanctuary return on the very same morning. This year’s return day included two Baltimore Orioles, one Orchard Oriole, two Gray Catbirds and a Common Yellowthroat, all banded by James in previous years. 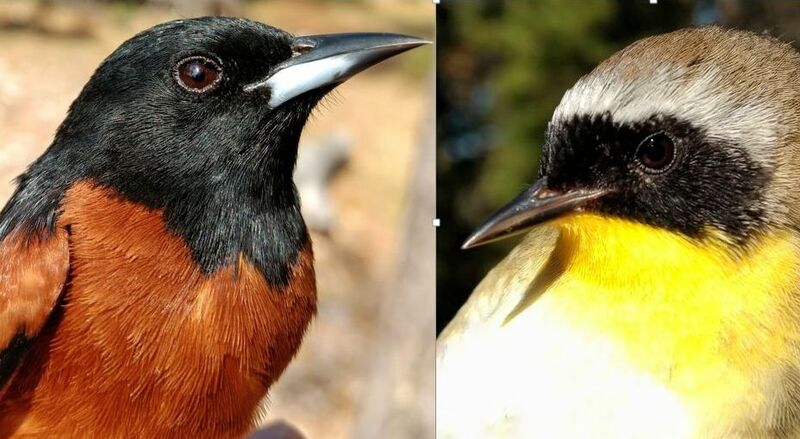 The first morning the banding team heard Orchard Orioles and Common Yellow-throats singing at the sanctuary was the same morning these previously banded birds turned up in the mist nets. 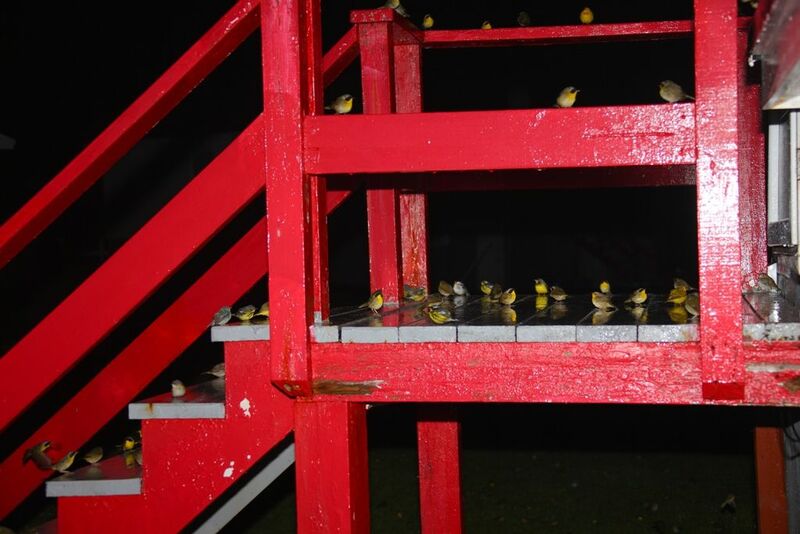 Around the second weekend of May, southern winds produced a load of birds–especially those that had never been banded, including seven species of warblers, two Lincoln Sparrows, and a Blue-headed Vireo. In all, James and crew logged 41 birds one morning, including 32 new birds—four times as many as the day before when the wind had been east-northeast. “During migration, we get plenty of birds on most days but if conditions aren’t right, they’ll be mostly recaps,” James says. “Recaps” is banding shorthand for recaptures—birds already banded but netted again. And in some cases again and again. That’s probably because they live at the sanctuary. Banding assistant Valerie Bourdeau returns from a net run with a small cotton bag used to safely carry captured birds back to the banding table. “We have an old friend!” she replies coyly when asked which species it is. Always nice to see a familiar face. 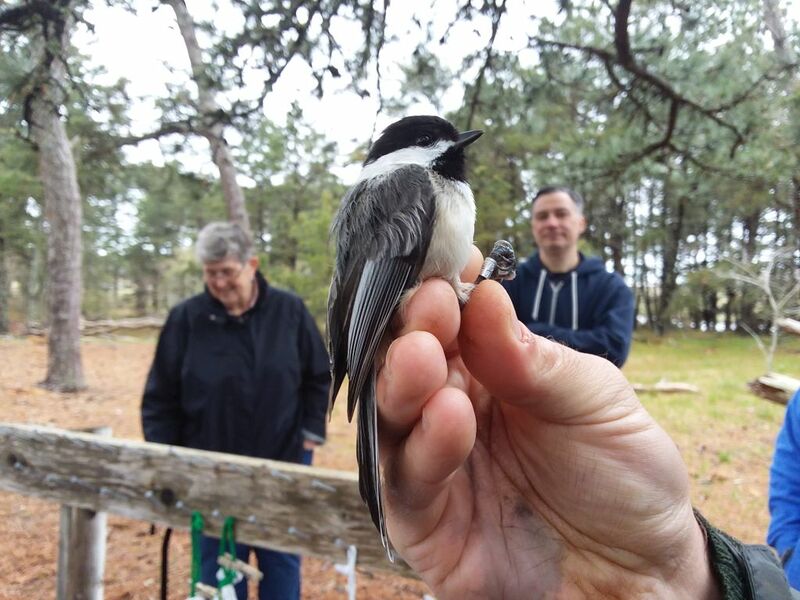 This bird was among the first captured when the banding station opened in September of 2014. The friend turns out to be one of the very first birds banded when James established the station in 2014. The bird is obviously at least 4 years old and is clearly a year round Wellfleet Bay resident. But a southwest wind isn’t the only cause of a large influx of migrants. A strong storm can force northbound songbirds to the ground to await more favorable conditions, a situation known as a migration fallout. Amazing pictures of this phenomenon were captured in May of 2011 during stormy weather off coastal Maine where dozens of warblers were grounded like little airliners on Machias Seal Island in the middle of the Gulf of Maine. Last spring, as many Outer Cape residents recall, it was a miserably cold, wet May with relentless northeast winds. James says it apparently caused a backlog of migrants and then a burst of activity. “Sixty percent of our captures came in a one-week stretch!” he recalls. Eastern Kingbirds are often seen perched on shrubs or posts in open areas to watch for insects. 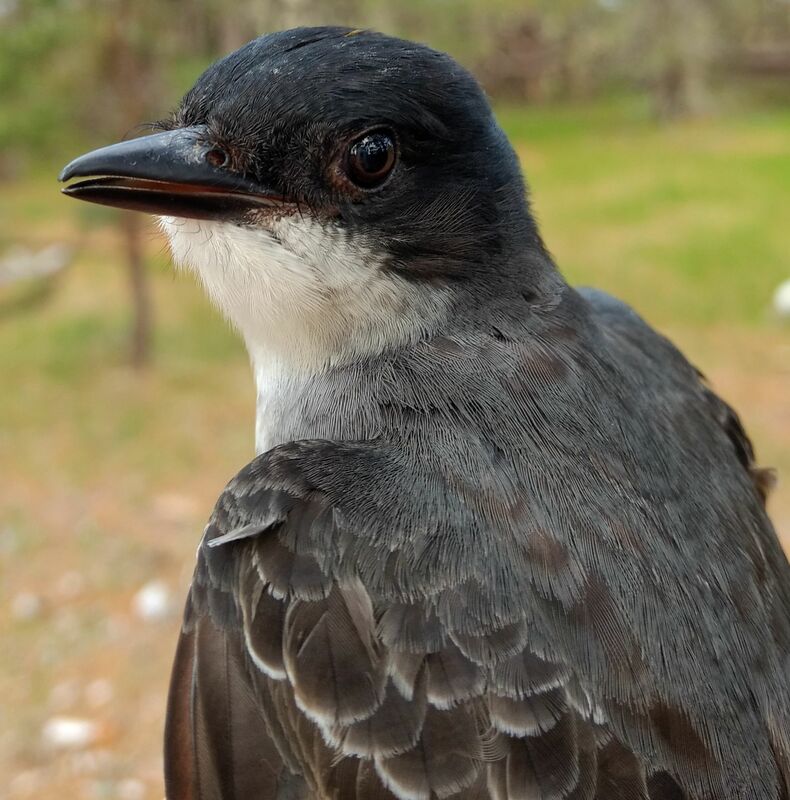 The recent capture of this handsome Eastern Kingbird signaled the beginning of the end of this spring’s mass movement of birds through the Cape. James says flycatchers, which include kingbirds, are primarily insect eaters so their later return may be timed with the availability of larger bugs. With the right wind, spring migration flies by. This entry was posted in Updates on May 30, 2018 by Wellfleet Bay. Love the update! Thanks to James & his crew that allow for a good banding season! Not to rush things but look forward to the autumn!